The virtual catalog direct lending services of the Boston Library Consortium (BLC WorldCAT NRE) and the Massachusetts Virtual Catalog (MassVC) are temporarily unavailable through the Carney Library. UMassD Library Services are in the midst of implementing and transitioning to a new library system, Alma by Ex Libris. In addition, the Massachusetts Virtual Catalog is in the beginning phases of moving to a new platform for its MassVC operations. During the transitions at UMassD and the changeover to new systems at the MassVC, these systems will be unavailable until further notice. In the meantime, all requests for books and articles can be still be submitted through the Carney Library’s Interlibrary Loan Services. If you have any questions, please contact us at: ILL@umassd.edu. This entry was posted in General Library, Information Resources, Library Resources & Services, Library Services on January 15, 2013 by cmcneil. We’re sorry, but all of the databases from the vendor EBSCO are currently unavailable. We are in communication with EBSCO to ensure that they return as soon as possible. It is not a UMassD problem, all libraries are experiencing this unavailability. We will post here again, when the issues are resolves. This entry was posted in Claire T. Carney Library Associates, Information Resources, Library Resources & Services on March 27, 2012 by cmcneil. Once again the U.S. Government Printing Office (GPO) and the Library of Congress (LC) have collaborated to increase access to the Congressional Record (CR). At the request of the House Administration Committee, LC created an iPad app that provides access to the daily edition of the CR dating from January 4, 1995. The app uses CR files and associated metadata provided by GPO. * Browse editions of the Congressional Record by date. * Perform keyword searches within individual documents or sections within documents. * Identify the latest bills and resolutions considered daily on the floor of the U.S. House of Representatives. * Identify the latest bills, resolutions, treaties, and nominations considered daily on the floor of the U.S. Senate. * Save documents to your preferred iPad PDF reader. * Share documents via email. For the full press release, see: <http://www.gpo.gov/pdfs/news-media/press/12news04.pdf>. This entry was posted in General Library, Information Resources, Library ONLINE Services, Library Resources & Services on January 20, 2012 by cmcneil. 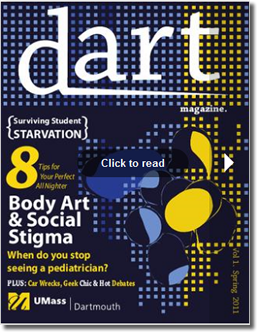 “DART is a product of the Umass Dartmouth Department of English. Over the past few months, undergraduate English Majors in ENL 369-02 (Document Design) and ENL 363-01 (Journalism) – most having little-to-no journalism experience, or ever having seen an InDesign screen have worked tirelessly to put together a fun, cohesive, cultural magazine. Students in the courses produced everything from the front cover to the graphics, page layouts, and article content”. This entry was posted in Information Resources on May 8, 2011 by cmcneil. The Diário de Notícias Newspaper Digital Collection and search tool was made public today. 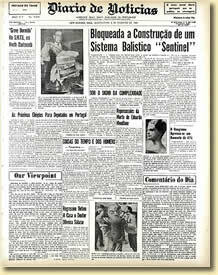 The Diário de Notícias Newspaper Digitization Project, developed and supported by the Claire T. Carney Library’s Ferreira Mendes Portuguese-American Archives in collaboration with the Center for Portuguese Studies and Culture, will make 84,010 pages from 16,641 issues of the Diario de Noticias accessible to the world. The materials cover 1919 through 1973 and are available at no cost over the internet to students and academic researchers interested in Portuguese-related issues, as well as individuals tracing their family genealogy. This entry was posted in Information Resources, Library Resources & Services on April 29, 2009 by cmcneil. Registration is now open for enrollment in the Interuniversity Consortium for Political and Social Research’s (ICPSR) Summer Program. This is a great opportunity for faculty and students to learn about quantitative research methods. The Summer Program offers a variety of educational opportunities including four-week sessions and three- to five-day statistical workshops. All ICPSR Summer Program participants will receive a certificate of attendance at the completion of the appropriate four-week session or workshop in which they are enrolled. The Library Services, Information Resources, and Technology (LSIRT) division’s membership to ICPSR qualifies our students and faculty to receive discounted registration. Please contact Professor Heidi Berggren (x8272) for program information. This entry was posted in Information Resources, LSIRT News on February 12, 2009 by cmcneil.